Scientists from China and Portugal have drawn inspiration from lotus leaves to devise a technique for arranging a wide range of materials, including cells, proteins and quantum dots, on a surface. Their method could be useful for making biomedical devices. The team, led by Wenlong Song from Jilin University, noticed how water droplets strip dust from lotus leaves when they roll across their superhydrophobic surface. ‘We supposed that if this could be managed by a suitable driving force, it would allow the transfer of water-soluble materials onto the surface,’ explains Song. 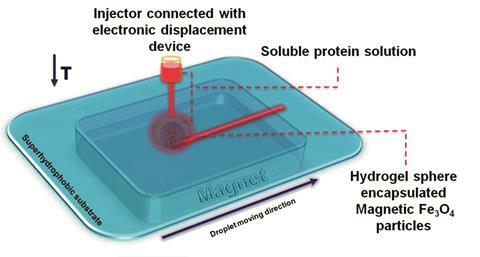 They’ve done just that and designed a protein printing method using hydrogel droplets controlled by a magnetic field. 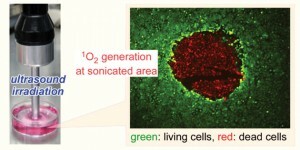 Check out the full story by Charlie Quigg in Chemistry World! A blood transfusion can be a life-saving gift – but if that blood unwittingly contains a deadly virus, it can kill instead of cure. Medical staff therefore needs to be able to quickly and easily screen blood for viruses and a new system developed by researchers in China can do just that: it checks for three viruses – HIV, hepatitis C and hepatitis B – all at once and could even be adapted for more. The quickest way to test a sample for viruses is by looking for their DNA or RNA –unlike antibody based tests this doesn’t need to wait for the body’s immune response to kick in before showing a result. Nongyue He’s team at Southwest University uses a process called amplification to multiply several viruses’ DNA or RNA at the same time, making enough to generate a strong signal when tested. Read the full story by Susannah May in Chemistry World. This article is free to access until 16 January 2016. Scientists in Japan have developed a nanofibre mesh that can adsorb creatinine from blood with the hope that it can eventually be developed into a wearable blood-cleaning device for patients with kidney failure. Kidney failure causes dangerous concentrations of waste products, such as potassium, urea and creatinine, to build-up in the body. Apart from having a kidney transplant, the next best solution for patients is dialysis. Dialysis, however, is far from ideal. It is time-consuming and relies on access to specialist equipment, clean water, electricity, dialysate, and, usually, a hospital. Often these requirements aren’t accessible in rural parts of developing countries and disaster areas. 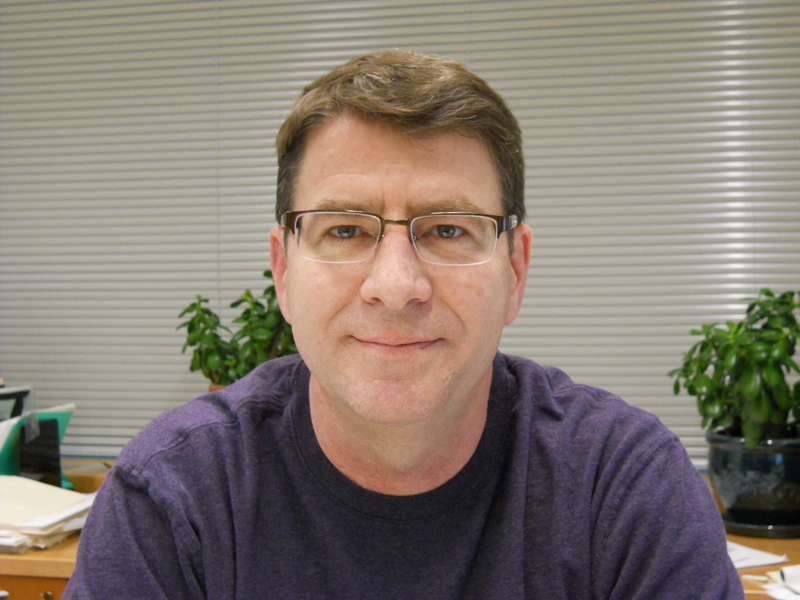 Phillip Messersmith, Biomaterials Science co-Editor-in-Chief, has been interviewed in Chemistry World about his work on biological adhesives to develop new biomaterials for the repair, replacement, or augmentation of human tissue. …What are the main applications for your synthetic polymers, are they just biomedical? Not exclusively, but the funding sources right now are primarily in health related areas. We have a lot of funding from the National Institutes of Health in the US and obviously their main interest at the end of the day is to contribute to basic understanding as well as the applications of new materials, new devices and new therapies. So we work through the government funding as well as some corporate and institutional funding towards applications. The application you mentioned before, fetal surgery, has been a great passion for me over the last few years. I only really became involved in this three–four years ago but it’s become really important to me. It’s the kind of medical problem that has too small a market to interest big companies and so the surgeons work in this area and do wonderful things without having all the tools they would like. One example of a tool they need is for sealing ruptures in the fetal membrane that occur spontaneously or after an interventional procedure. The ruptures can lead to leakage of amniotic fluid and when that happens you have two major problems. First, is the risk of infection and second is the premature induction of labour. Either way you have a very serious medical problem for the mother and the fetus and there aren’t many ways to treat this apart from bed rest. There’s a small community of fetal surgeons that have trained for many years to try and avoid these ruptures but if it happens there’s not a lot they can do. So we’re developing materials to try and seal the membranes after rupture. Here obviously the tissue is wet and there’s a large volume of high ionic strength fluid. This is not very different from the conditions encountered by mussels- thus providing a great argument for learning how mussels and other marine organisms can accomplish wet adhesion. How easy is it to make these materials biocompatible? That’s a great question and something we spend a lot of time thinking about. Biocompatibility is an all-encompassing word: but it’s all about context. All we can say is we try to develop systems based on biocompatible polymers and DOPA and then formulate them in a way that doesn’t induce a severe inflammatory response. But any synthetic material has some level of that response. There’s an interesting give and take between in vitro results and in vivo results. A positive in vitro result won’t necessarily translate to a positive in vivo result. One of the interesting things is that the opposite is also true. Sometimes in vivo cell toxicity assays give a borderline response but in vivo we see really good results. We choose the polymers and how we go about the functionalisation and purification very carefully and then we do in vitro and in vivo tests. Going back slightly, what made you get into bioadhesion? Follow the latest journal news on Twitter @BioMaterSci or go to our Facebook page. An international team of scientists has developed a novel insulin delivery system for nasal administration. The study aims to provide an alternative to regular injections through the delivery of insulin via the nasal membrane in the form of a hydrogel. This route offers a relatively high bioavailability, avoidance of the first-pass effect (in which a drug’s concentration is reduced before it reaches the systemic circulation) and painless administration. Considerable research effort has been dedicated to developing alternative non-invasive insulin delivery systems, including oral and transcutaneous administration. The major limitations of nasal delivery are the rapid mucociliary clearance of a drug to the nasopharynx, resulting in a short time span for its absorption, and the low permeability of the nasal membrane to peptides such as insulin because of tight junctions between epithelial cells. Read the full article by Michael Parkin in Chemistry World. Scientists in Australia are a step closer to printing living cells for tissue engineering with the development of a new bio-ink that allows the cells to stay alive until they are printed and not clog up the printer nozzle. A cancer treatment that uses titanium dioxide nanoparticles to kill tumour cells has been given a sound revamping by researchers in Japan. The new strategy improves the stability of the nanoparticles and the treatment may be able to penetrate more deeply into human tissues than ever before, targeting problematic tumours, through the use of ultrasound. Atsushi Harada and colleagues at Osaka Prefecture University encapsulated the titanium dioxide nanoparticles inside micelles (an aggregate of surfactant molecules dispersed in a liquid colloid). 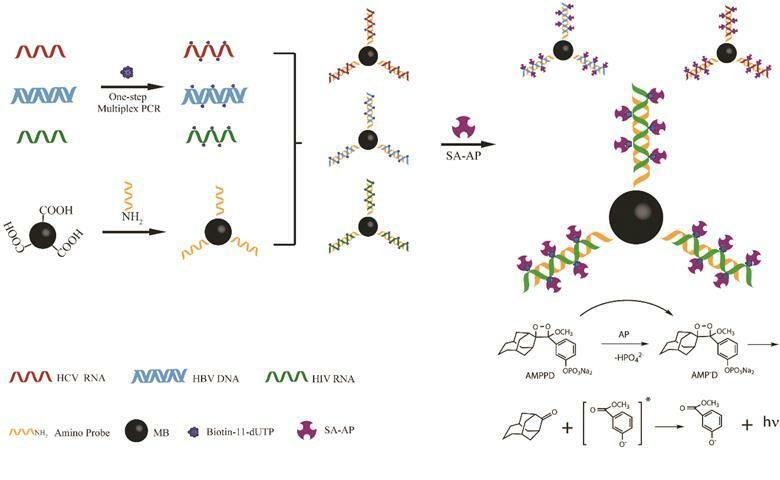 The team grafted polyethylene glycol, a polymer with many medical uses, onto the micelles to stabilise them, improve their biocompatibility and to ensure that the micelles had negligible cytotoxicity. ‘Low cytotoxicity is the most important property of our micellar system’ Harada explains.